From wedding proposals to college graduations, there's nothing wrong with reaching for the camera to capture a special occasion, but sometimes a photo isn't quite enough to immortalize life's greatest moments. 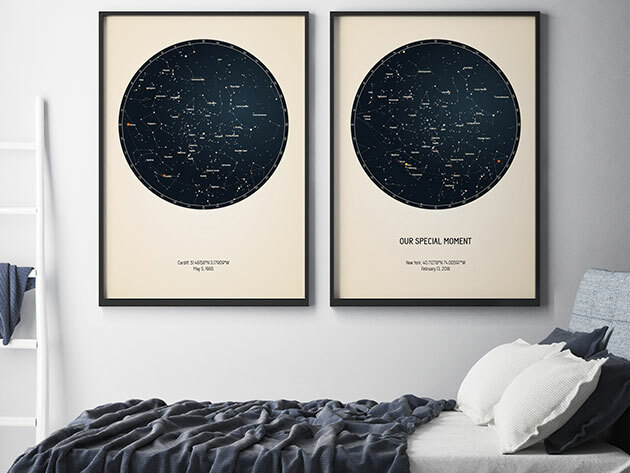 Whether you walked down the aisle or into your first home, Strellas Personalized Star Maps commemorate your biggest milestones on a stellar scale. You can get your own 18x24 star map today for $38. Strellas Personalized Star Maps depict the exact positioning of the night sky during the time and place of your special moment. Strellas uses NASA Astronomical Data Center's star catalog to accurately recreate the sky view from a time and place you choose. You can personalize your maps with custom quotes and select special color styles before receiving the product as a printed poster or a printable digital file. Strellas Personalized Star Maps are available in the Boing Boing store for $38 for 18x24 sizes and $45 for 24x36 sizes.